Daniel Barth (Yuba Historical Society) and Cory Wilkins (Middle Mountain Foundation) for reviewing prior to publication. The Maidu Indians who lived east of the Buttes called them Histum Yani, and the Wintun Indians, who lived to the west, knew them as Onolai-tol. 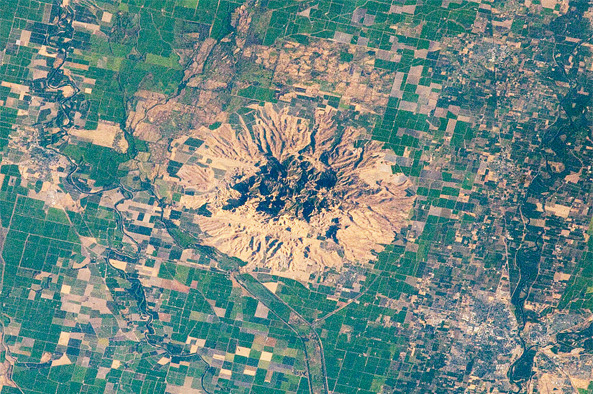 Both names translate to “Middle Mountain.” Rising like an island in the center of the Sacramento Valley, the Sutter Buttes figure prominently in the creation stories of these two Native American tribes. The origin stories differ: sometimes the Sutter Buttes arose out of water or darkness or chaos, created by the falcon spirit animal. In other stories, the Buttes were where Earth Maker dwelled after having made the world. But just as the Sutter Buttes have a place at the beginning of creation, they also play a vital role at the end of life. In many native traditions, the Buttes are a mysterious, powerful portal to the spirit world, a stopping point for the dead on their journey to the afterlife. In some traditions, the Buttes are so powerful and holy that stepping foot in them is forbidden except to healers and spiritual leaders. Northern California native peoples, such as those belonging to the Maidu and Wintun nations, did not live within the Sutter Buttes but seasonally traveled to the foothills to gather acorns, hunt and perform rituals and ceremonies. Their home villages were along the Sacramento and Feather rivers, where the Buttes’ prominent peaks dominated the people’s spiritual and visual landscape. Oak trees dot the grassy slopes of these ancient, eroded volcanic domes, which culminate in a rough circle of steep, craggy spires — the highest peak tops 2,100 feet. The Sutter Buttes are approximately 10 miles across, with a total footprint of 75 square miles, about 1.5 times the size of San Francisco. The mountain’s plant and animal community is similar to those found in the foothills of the Coast Range to the west and in the Sierra Nevada to the east. But for thousands of years, the Sutter Buttes have been separated from these regions by 40 miles of grasslands, a separation that has created an “island effect.” Although there are no plants or animals endemic to the Sutter Buttes, over millennia this separation created a unique biological community. The Buttes are where some plants and animals have their most northerly extension of their range, while others their most southerly. In the 1830s a malaria epidemic brought by European fur trappers killed an estimated two thirds of the area’s native population; later diseases such as smallpox and cholera killed even more. The California Gold Rush displaced ancestral villages when the establishment of towns pushed the few remaining Indians onto remote village sites. When California joined the United States in 1850, the state passed legislation allowing for Native Americas to be forced into “apprenticeships.” These events devastated what was once the densest population of native people in America. Finally, in 1862, many Sacramento Valley Indians were forcibly relocated to a reservation. Today, the closest Native American settlement is a Wintun “Rancheria,” or tribal land, about 10 miles west of the Buttes. Despite the devastation and displacement, the Sutter Buttes continued to be an important part of Native American mythology. The Sacramento Valley native peoples had long performed sacred dances, some of which are traced back to visions of dancing animals and spirits in the Sutter Buttes. In the 1870s, the California Ghost Dance synthesized with the Wintun’s Hesi ceremonies into the Big Head dance, in which participants danced for restoration of their Indian way of life. The Big Head dance is still performed today as a dance of renewal. By the late 19th century, the Central Valley’s rich agricultural land was primarily cultivated in wheat. Today the once vast grasslands have been converted to rice fields, while the oak woodlands are now orchards for walnuts, prunes and peaches. Sheep primarily grazed the upland of the Sutter Buttes until cattle production took hold about 50 years ago. Future development and land-use strategies in the Sutter Buttes are the main concern of conservationists and Native American communities, who want to see the Buttes preserved and not sold for housing development or resorts. About a dozen families own the majority of land in the Sutter Buttes, much of which is still used as ranchland. Most of the private landowners in the Sutter Buttes have a family relationship with the land that spans more than 100 years. They are proud of their ranching heritage and their private stewardship of the land and want to see it remain undeveloped. The California Parks Department owns a 1,785-acre parcel of land on the mountain’s northern flank; this undeveloped park is currently closed to the public due to state budget shortfalls. While land in the Sutter Buttes is zoned as agricultural, the current Sutter County land-use plan allows for the land to be divided into lots as small as 20 acres. Critics of the current zoning contend that this opens the door for luxury residential construction that could gradually erase the natural landscape and spiritual nature of the Buttes. That’s what happened in 1999, when 1,100 acres in the foothills of the Sutter Buttes were sold and subdivided into 11 large lots. Five luxury homes have been built on those lots since then. In total, there are around 30 subdivided lots that cover approximately 2,500 acres. In 2007, Sutter County approved the division of 900 acres of Sutter Buttes foothills into 13 lots. A local organization, the Yuba Historical Society, sued the county and the developer on the basis that there was no environmental impact report completed and that an illegal road variance was granted that could open up development anywhere within the Buttes. The lawsuit was settled in January 2010, with Sutter County setting aside its 2007 approval of the land’s division. Sutter County is currently revamping its General Plan, including zoning designations in the Sutter Buttes. The plan will not be adopted until late 2010, but draft proposals point toward zoning restrictions that will keep any subdivided lots to 80 acres or greater. Such changes would prevent development of dense subdivisions, but would still allow for construction of luxury homes on large lots, such as those built in 1999. Even with changes to zoning, those who advocate preserving agricultural and undeveloped land in the Buttes worry that zoning designations could become vulnerable with each election cycle as local government leadership changes. One strategy for land preservation is to protect land through conservation easements. The Middle Mountain Foundation is a land trust that actively purchases development rights from willing landowners through conservation easements in the Sutter Buttes; it then holds these easements in perpetuity as a protection against development. The foundation currently owns about 200 acres in the Sutter Buttes and plans to purchase 1,800 more acres through conservation easements. For the time being, however, the current downturn in California’s economy and real estate market has eased development pressure. Depressed housing sales, stricter housing loan guidelines, and cautious investors all combine to protect the Buttes, at least for now, from aggressive real estate development. When the housing market recovers, however, the Buttes may attract new real estate development because of revised Federal Emergency Management Agency flood maps. These maps, which go into effect at the end of 2011, place most of Sutter County in a flood zone, a designation that is projected to quadruple home insurance premiums. The Sutter Buttes are not part of the new flood zone, which may lure homebuyers and developers seeking to avoid the sharply increased insurance premiums. Though members of the Maidu and Wintun communities now mostly live far away from the Sutter Buttes, they are nevertheless involved in the issues there. In 2005, members of the Mechoopda Maidu Indian tribe testified before the state’s park commission, asking that the parkland in the Sutter Buttes be granted a name that reflected the Native American heritage. (To date, the park has been temporarily designated as Sutter Buttes State Park.) They also requested that it be designated as a cultural reserve, a request that has not been realized. Within the native community, however, there are differing opinions on the Sutter Buttes. Some feel strongly that there should be little to no human presence there, while others hike into the interior Buttes as guides on hiking trips that directly support conservation efforts. Since 1976 close to 40,000 adults and school children have visited the Buttes on such guide-led public tours. The only way the public can gain access into the Sutter Buttes is to join several guided hiking tours that are offered in cooperation with landowners and the state park system on a limited, for-fee basis by the Yuba Historical Society and the Middle Mountain Foundation. Monies collected support their land preservation activities. You can also support the work of these organizations by becoming a member. Anderson, Walt. Inland Island: The Sutter Buttes. Prescott, AZ: Natural Selection, 2004. Barth, Daniel (Yuba Historical Society). Telephone interview, November 30, 2009. Barth, Daniel. Middle Mountain Montage. Video Clip. YouTube, January 1, 2009. Brown, Laura. “‘Chipping Away’ at Sutter Buttes.” The Union, December 12, 2007. Geiger, Steve (Sutter County Planning Services). Telephone interview. December 15, 2009. Hubbartt, Mike. Images of America: The Sutter Buttes. Mount Pleasant, SC: Arcadia Publishing, 2010. Knapp, Don. “A Chance to Hike California’s Hidden Buttes (Maybe).” New York Times, March 16, 2007. Lindahl, Kathleen. “A Short History of Peace Valley in the Sutter Buttes of Central California.” California Department of Parks and Recreation, November 3, 2005. McHugh, Paul. “Sutter Offers Many of Nature’s Wonders.” San Francisco Chronicle, September 28, 2000. Mechoopda Maidu Indians. Mechoopda Maidu Indians. Middle Mountain Foundation. Middle Mountain Foundation: The Sutter Buttes Regional Land Trust. Ortiz, Gamaliel. “Hike Into the Sutter Buttes, Relics of Geological History.” The Sacramento Bee, November 12, 2009. “Sutter County General Plan Update.” Sutter County. Ward, Arlene (Mechoopda Maidu Indian Tribe). Telephone interview. December 16, 2009. Wilkins, Cory (Middle Mountain Foundation). Telephone interview. November 24, 2009. Yuba Historical Society. Yuba Historical Society. Yune, Howard. “FEMA Flood Maps for North Sutter Won’t Arrive Until 2011.” Appeal-Democrat, December 7, 2009. Yune, Howard. “Future Growth in Sutter County Debated.” Appeal-Democrat, October 26, 2009. Yune, Howard. “Settlement Stops Land Split in Buttes.” Appeal-Democrat, January 20, 2010.